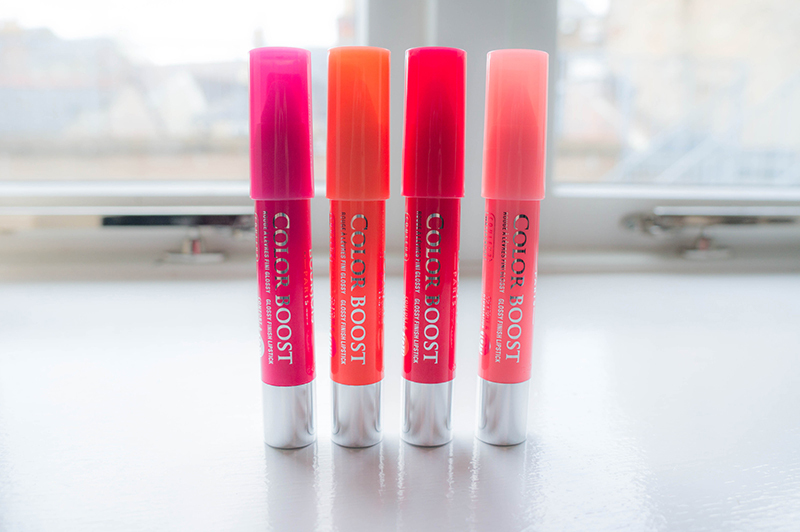 Yet again I'm late to the party with my review of these four gorgeous lip crayons from Bourjois. I actually had these in my 'to review' pile and kept meaning to get round to them, but priorities kept changing. However, Bourjois have knocked it out of the park yet again with such a wonderful release. 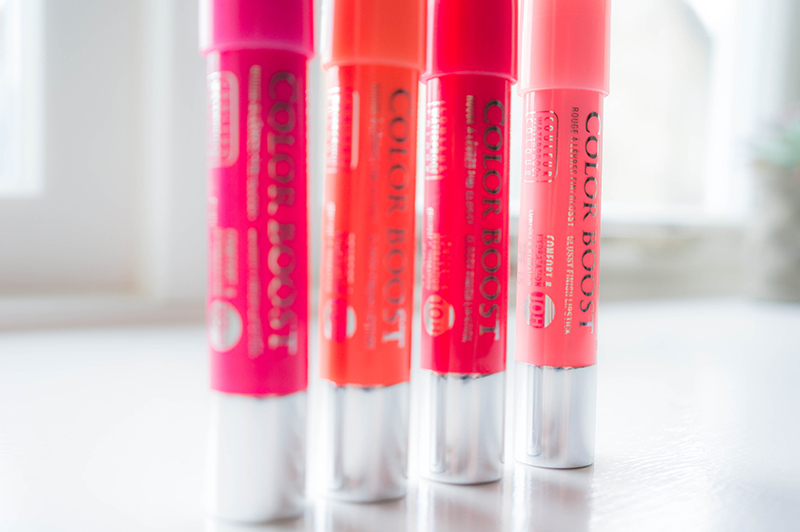 To try and rival the Clinique Chubby Sticks is a fair task, but I believe this high street brand have had a fair go and created some wearable and versatile shades anyone can get on board with. Not usually my style (I opt for more of a matte finish), these glossy lip crayons boast an impressive range of features including 10 hours of hydration and SPF 15 all while looking sleek and glossy. The formulation is smooth, leaves lips full of moisture and look beautiful when applied. My only gripe is they don't tend to stick around long on the lips, but I didn't expect this much from such a shiny product. Peach on the Beach is a very light peachy pink. This has fast become a daytime favourite and perfect for pairing with a much more daring smokey eye to tone a look down. Orange Punch is a fairly pale orange, ideal for those who'd like to sport an orange lip but are worried the colour will wash them out. Fuchsia Libre is a vibrant pink, lending more toward the purple end of the spectrum being cool toned. Perfect to stay on trend for the remainder of the summer. Lastly, Red Sunrise is my favourite of the bunch. A red with pink tones, intense colour but without scaring off those that fear they can't wear red. Beautiful on all skin tones! 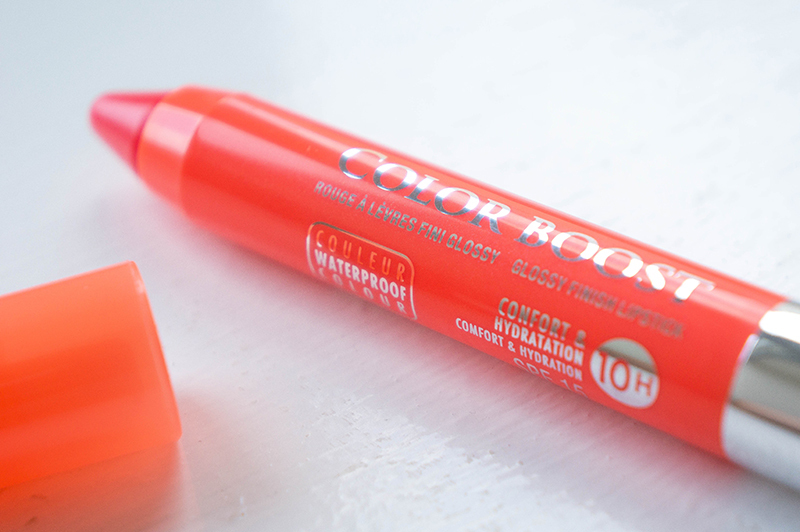 Have you tried the Bourjois Color Boost Lip Crayons yet? What is your favourite? Love this, they are amazing! Such a pretty shade, isn't it? Ooo the red looks nice, I may invest! JaynieShannon | UK Beauty & Style Blog | I Follow Back. Please do, it's such a wearable red that I'd recommend it to anyone! everyone is going on about these at the moment if they are as good as revlons lipstains may have to get some! I've not tried the Revlon Lipstains, but I do like these. I wasn't sold on the hype when I first tried Peach on the Beach, but a second wear and then trying the other colours, I was hooked! Thanks Zoe. :) For the prices (and usually on 3 for 2 at Boots) they're worth the money. Hehe, wouldn't usually be my thing but I'm loving them so much. Red Sunrise looks really pretty! Definitely on my to-buy list. Awesome, you won't regret it! Thank you Maddy, I don't usually find lipsticks this wearable. I don't think I've heard any negatives. Perhaps on that they're glossy, not matte, but not everyone likes matte either! In love with orange punch & peach on the beach - gorgeous colours! Thank you Rachael, I've been told Orange Punch looks the best on me. Sophia, I could recommend these to you every day of the week. The Peach on the Beach shade would look gorgeous on you. I really need to figure out where I can get these in the US... they look amazing!! Haha, well if you really wanted I could see about shipping them over. These shades are absolutely gorgeous, lovely pictures! It really is, probably my most worn colour last month. They are, I don't feel that my lips are dry after the colour has worn off. ♥ You're such a sweetheart Kallie. Thank you Coco, that means so much. Red Sunrise and Peach on the Beach are definitely on my wishlist! They are the best colours of the 4 without doubt! Very glossy, but not in that awful 'hair sticks to your lips' kind of way. Ahw, thank you so much Maddy, that's really lovely. Ughhh I want these! All the shades are gorgeous! I'm really surprised they haven't branched out there yet! Thank you Connie, I'm really touched. oooh need to try one of these! I love fuchsia libre. These look fab! They all look so nice,definitely going to check them out next time I go shopping. Loving the blog! Thank you Naomi! They are worth having a swatch and seeing that you think might work for you. Ohh I love peach on the beach, looks beautiful! You rock all the shades! Thanks Zoe! I wasn't sure I would but I do love them all! You know I love love these, can't wait for more shades soon! We are definitely advocates, Katie. New shades need to get here now! They'd look wonderful on you, Rosie! I do if Im having a good hair and makeup day, but it seems to be quite popular so I will keep it up. Love the look of these! Wonder how they compare to the soap and glory gloss sticks. I'd love to know this too! I've not heard much about them. They're just so gorgeous it's difficult to only have one!